Furry fans into the World of Warcraft game and its story background might want to check out the new World of Warcraft: Curse of the Worgen comic book mini-series, published by the Wildstorm imprint of DC Comics. For those who don’t play the game, according to WOW-Wiki: “Worgen are large, lupine humanoids reminiscent of a werewolf that walks upright, but lopes on all fours to run.” The five-issue comic book, exploring the mysteries of the Worgen and where they came from, was written by Micky Neilson and James Waugh. The full-color art was created by Ludo Lullabi, Tony Washington, and John Polidora. The first issue is on sale now. One of the newest and perhaps most interesting developments of on-line shopping is the concept of on-demand DVD burning. In other words, they make it when you order it, and not before. That saves a great deal of money that would otherwise have to be sunk into creating “back stock” of items that might not be sold if only a limited audience is interested in them. Warner Brothers (parent company of Hanna-Barbera) is taking this to heart it seems, with several new offerings. One of them that furry fans should definitely take note of is SWAT-Kats: The Radical Squadron, available real-soon-now on demand as a 5-DVD set from TV Shows on DVD. The link will take you (more quickly) to the Warner Brothers site where you can order the DVD. Now available on Blu Ray disc is the special Teenage Mutant Ninja Turtles 25th Anniversary Collector’s Edition Movie Collection (whew! ), featuring all three of the original live action Ninja Turtles movies (the first, Turtles II: Secret of the Ooze, and Turtles III: Turtles in Time) as well as the TMNT CGI movie, all in one box. We’ve seen it quoted at many different prices (from about $30.00 on Amazon.com down to about $15.00 in the Previews magalog) so do your homework and do some shopping around before you buy! Just in time for the much-anticipated (?) Yogi Bear live-action/CGI movie, Insight Editions is releasing Yogi’s first book in hardcover on December 1st. 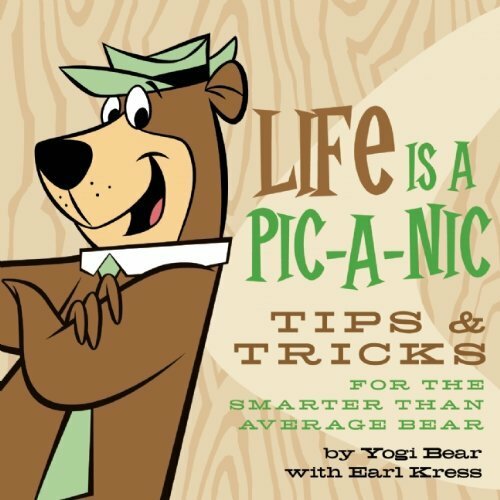 Life is a Pic-a-Nic: Tips and Tricks for the Smarter Than Average Bear was written by Yogi with the assistance of Earl Kress. Here’s the publisher’s description: “For Yogi Bear, the glass is always half full and every day is a gift ripe with opportunities, new friends, and tasty treats. The Tao of Yogi is one of love and tolerance: love thy neighbor, harbor no ill will, and share your gifts, and life will reward you with goodies. Live by these rules and you can’t go wrong. Happiness is Yogi’s message, his reason for being, and Life is a Pic-a-Nic is his manifesto.” You heard it here folks. Graphic Universe, an imprint of Lerner Publishing, has two furry-themed graphic novel series that might be of interest to young readers and their parents. Guinea Pig — Pet Shop Private Eye (by Colleen Venable (writer) and Stephanie Yue (artist) tells the story of a guinea pig named Sasspants, who likes to read in her cage. When one of the letters on the front of her cage falls off (leaving “PI”), one of the other animals mistakes this to mean “private investigator” and enlists the help of Sasspants to solve a mystery. Now Sasspants has a new career! Meanwhile there’s Mr. Badger and Mrs. Fox by Brigitte Luciani (writer) and Eve Tharlet (artist). When Mrs. Fox and her daughter Ginger are driven out of their den by a hunter’s dog, they move in with Mrs. Fox’s friend Mr. Badger — which the adults quite enjoy actually. Unfortunately, Ginger and Mr. Badger’s two young sons do not! The series presents woodland adventures while also giving life lessons about growing up in a step-family. Volume 2 of each of these continuing series is out now. Okay, so, recently the trailer for Kevin James’ 2011 live action/CGI film The Zookeeper has been making the rounds at movie theaters. The animation and cartoon blogs have been going “wild”, calling it friendly things like “Madagascar in live action with a fat guy” and such. We’ll let you make your own decision when the film comes out on July 8th. Here’s the official description from Sony Pictures: “In Zookeeper, the animals at the Franklin Park Zoo love their kindhearted caretaker, Griffin Keyes (Kevin James). Finding himself more comfortable with a lion than a lady, Griffin decides the only way to get a girl in his life is to leave the zoo and find a more glamorous job. The animals, in a panic, decide to break their time-honored code of silence and reveal their biggest secret: They can talk! To keep Griffin from leaving, they decide to teach him the rules of courtship.” Really now. The film is directed by Frank Coraci, who’s directed several successful comedies starring Adam Sandler — including The Wedding Singer, The Waterboy, and Click. In The Zookeeper, Sandler plays a monkey. According to Cinema Blend, the film was originally scheduled to be released this fall, but Sony later decided to save it until next summer and put it up against films like Transformers 3 and the final Harry Potter film. Really. If you’ve not yet discovered Bear Nuts, the popular and very surreal on-line comic written and illustrated by Alison Acton, the story continues at their web site. Now DMF Comics has released Bear Nuts Volume 1: The Book of Prozac as a full-color softcover graphic novel, collecting together several of the comic’s storylines. “As one of the largest exhibits at the Discount Zoo, (in both size and number of inhabitants) the bears attract a lot of attention… something none of them are happy about. Between gawking adults, jeering children, and their own rather profound personality clashes, it’s a wonder the bears can get through each day without maiming each other… well, most days.” Trust us, it’s much stranger than that… Meanwhile, Bear Nuts Volume 2: The Book of Evil is promised to us very soon. Steve Hamaker (best known as the colorist for some issues of the comic Bone) created a rather strange superhero comic known as Fish ‘n’ Chips. Now Cartoon Books brings together the first issues in a full-color trade paperback, Fish ‘n’ Chips Volume 1. Here’s how they describe it: “Solomon City is under attack by vampyres, and the only people willing to stand in their way are a telekinetic goldfish with a robotic body and a lightning-charged cat! Don’t miss the origin story of the superhero team of Jaxer ‘Fish’ and Clave ‘Chips’! Exclusive pin-up gallery features new works by James Kochalka, Alex Robinson, Andy Runton, David Petersen, and Kazu Kibuishi.” The graphic novel is available now on Steve Hamaker’s web site. In the past we’ve told you about Firebreather, the comic book series created by Phil Hester and Andy Kuhn, published by Image Comics. Now it seems that Cartoon Network has gone and snuck out a CGI movie based on it! The story is the same as the comic, described here from Firebreather’s Wikipedia entry: “High school teen Duncan Rosenblatt is the son of divorced parents — a typical suburban soccer mom who wants him to get into a good college, and a 300-foot fire-breathing dragon who wants him to follow in the family business — conquering the Earth and inheriting the throne of King of Monsters; they share custody. Like every other teenager, he struggles to fit in with his peers. His being half-dragon further complicates matters.” The movie comes to Cartoon Network on November 24th. Check out the trailer on YouTube, too.